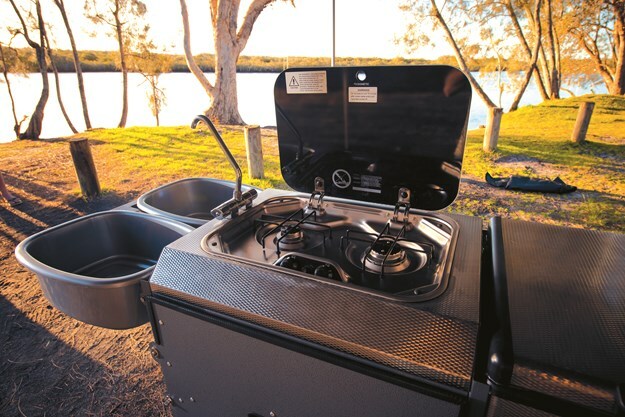 Conqueror Australia is undergoing a shift in its camper trailer market profile, marked by the release of a series of Platinum editions across its range throughout 2018. These are all high-spec updated versions of existing models with new-found natty paintwork giving them a whole new image, well away from the olive green military-style persona that defined the brand on its initial Australian debut. The first such upgrade was the Platinum edition UEV-490 camper trailer. This camper is Conqueror’s top-of-the-line model, and if you asked anyone who knew camper trailers to describe a Conqueror this is what they would attempt to get their words around. 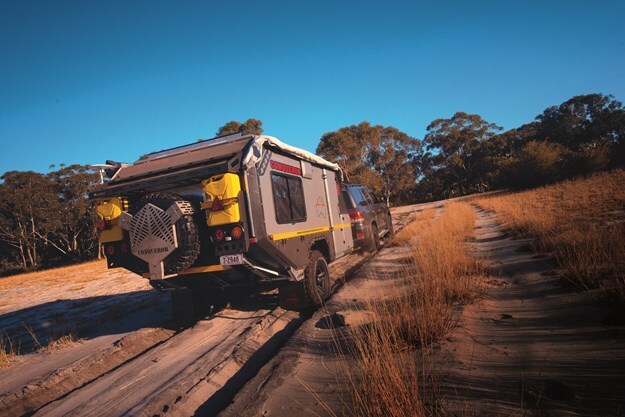 It’s a hybrid design that’s capable of sleeping up to four people, with an extensive list of features that is very much along the line of several camper trailer brands that were released here a few years back, but the only one of those still available today. As a hybrid, it fits well with the current market preference for a hard roof and walls and the minimal necessity for canvas. Being designed and built in South Africa, it comes with a high standard of design and engineering. As a high-spec version, it isn’t cheap at $84,902. 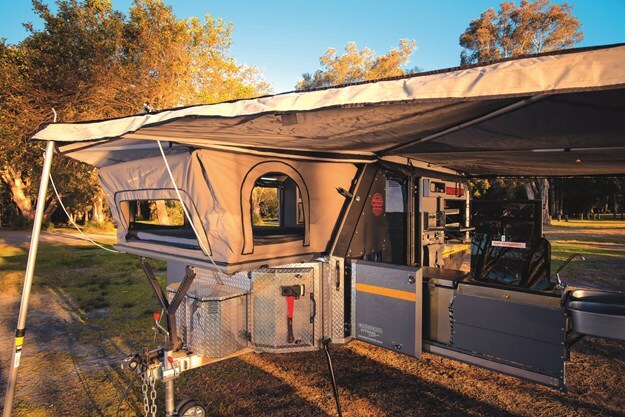 Generally, the Conqueror UEV-490 camper trailer has excellent construction. All materials are tough and long-term – stainless steel, aluminium, zinc-coated steel – with no plastic or fibreglass. The camper sits on a hot dip galvanised RHS chassis with a lengthened drawbar. The camper that we were shown had the original drawbar as per Conquerors of recent times, but about two weeks later we were contacted by the factory with photos of their new drawbar design, which extends the drawbar by 300mm. This would reduce the camper’s ramp-over angle and manoeuvrability in tight scrub, and would make it easier to reverse and provide more room around the front for setting up the front bed. The new design is a high tech laser-cut and folded design, all hot dip galvanised, that enables the fitting of a new larger front storage box. Does this Conqueror camper trailer need a stone guard? Conquerors have not come with one in the past, but with a rather short drawbar the space for stones to be getting up and ricocheting off the front of the camper was restricted, but with the new extended bar this may prove a weak spot. Time will tell. The suspension is a proven trailing arm independent design, as used in armoured personnel carriers in South Africa, with heavy duty Dobinson springs and 100mm diameter Tough Dog shocks to minimise heat build-up. The brakes are 12in electric units with 16in alloy rims and 285/75 R16 all-terrain tyres. The spare wheel mount on the rear wall is actually a spare stub axle in case you ever need one. Sitting over the spare is a stainless steel barbecue frame, with jerry cans both sides and a wood rack above. The drawbar mounts a Cruisemaster DO35 V2 coupler and a removable jockey wheel. The handbrake lever is also more exposed and easier to access. So the underpinnings are all stout. The front of the camper has now a 40 per cent larger box. The new model Webasto diesel hot water/space heater system with its large reserve tank is also mounted in here. This is reportedly much quieter than in past versions, though without the two beside each other we couldn’t verify just how much. The gas bottles are still enclosed in their own separate box. As explained the new paint is a hammertone finish with powder-coating in ash grey and black and, in this writer’s opinion, is much smarter and more fashionable than the old olive green. On the pop-up roof is a 320 watt (2 x 160 watt) fixed Enerdrive solar system, up from 200 watts in the past, so the batteries should be able to remain fully charged. Additional panels can be plugged in through the drawbar Anderson plug. The camper comes equipped with a 40 amp Enerdrive DCDC charger with ePro monitor and a full Conqueror battery management system, which gives you digital details of the batteries’ state of charge, amps in and out, volts and battery temperature, plus five circuits (fridge, outlets/media, accessory plugs, lights and pump) and circuit breakers, plus three outlets (cigarette, Merit and USB). Below are a Topargee water gauge, Webasto control switch and stereo system with four speakers. A 19in LED television/DVD player on a pivoting mount completes this setup. While the UEV-490 comes standard with two 105Ah AGMs there is an optional lithium battery package and even air conditioning. All up the camper is equipped with four 12 volt outlets and two dual USB charging outlets, as well as two 240V outlets internally. Internal lighting has been improved and reading lights installed for both the extendable front bed and the internal bed(s), as well as two LED strip lights for under awning illumination. Additional internal comfort has been provided by the installation of roof insulation to keep things cooler in summer and warmer in winter, and dual internal fans. Externally the canvas is now of a heavier grade of ripstop material than in the past and the design has been changed to minimise setup times. The awning shape has been changed and now consists of two separate 2500 x 6500mm areas – one on each side – standing on four poles each under the ends of radiating and perimeter spreader bars that swing out from the camper body. In windless conditions these can simply stand in place but anyone who went to bed assuming that there definitely would be no wind overnight is asking to be woken in the middle of the night by the clatter of falling aluminium poles. A ground sheet to sit beneath each awning is supplied as part of the package, while the walls for the awnings are options. For pegs, Conqueror supplies its own brand of spring steel units that do away with the need for coil springs on the ends of the ropes. The UEV-490 camper trailer still comes with its huge driver’s side shower room with privacy walls, all included as standard. The inside of the door which leads out to this area still has the handy fold-down shelf and storage space, plus large size canvas pockets below, which makes for comfortable ablutions in the morning. On the forward side of the doorway is a pull-out optional handbasin with powered hot/cold tap or optional auto-flush toilet stored in its own locker. Access from the camper interior is assisted by a sturdy fold-down step and the shower tucks away into a small side locker beneath the large LED light for the area. The available water supply for the camper is a single 135 litre tank, which seems a bit restricted for a setup such as this with its own shower and taps all around. The pantry, on the passenger’s side, has been widened from 150mm up to 270mm and is also deeper, and is equipped with an interior light. Touch-operated LED bars have been added over each side door. The 530 x 1020mm internal table, which also serves to make the rear side benches into a bed for two with the addition of the seat back cushions, is removable and can attach to an external sail track immediately behind the passenger side doorway to become a bar table seating up to four people, or to act as additional meal prep space. Internally there are still the many smaller storage bays, all fronted with zip-open canvas doors, plus several handy shelves, though the steel walls and canvas do tend to give it all a stark atmosphere. Along the floor internally are tie-down bars to restrain any larger items that might be carried inside. Setup is in many ways simple. The great rear stabiliser legs on the Conqueror UEV-490 remain, which simply adjust to the required length and are then snapped into place, and much quicker and easier than the wind-down systems on most other campers. However, if you are using the front bed – which most Conqueror owners seem to do – it becomes a bit of a jigsaw. In the standard versions this is exacerbated by the lack of room around the front of the camper and requires some shuttling back and forth from one side to the other. In some ways it was quicker to disconnect the camper from the tow vehicle to avoid either walking around the back of squeezing back and forth over the drawbar. The new longer drawbar obviates much of this. The front angled wall of the camper folds down to make the base of the bed, being supported on a fold-down attached leg; internal hoops are erected to support the canvas, and a 'tropical roof' type of shelter stretched over the top on spring loaded supports.The bedding is then inserted into the space inside. This need to make the bed at each stop would be a turn-off for me but is an accepted part of using a UEV-490 by most of its adherents. How you choose to sleep with this bed is a personal choice. Most people I know with this type of camper seem to sleep with their head at the outer end of the bed and their feet towards the interior, but this strikes me as being a bit claustrophobic as the space between the bedding and the canvas roof is not great, though the three zip-down windows around the bed would help with airflow to diminish that sense. One good feature that I quite like with the UEV-490 is the cabin pressure fan. Situated on the passenger side wall it sustains a positive internal pressure, drawing air through a filter, to keep out dust. I’m surprised more campers don’t have them. As with most South African campers you get a lot of add-ons included in the price: shovel, axe, jerry cans, gas bottles, crockery, cutlery, glassware, bedding. The kitchen is designed around a pull-out slide in front of the passenger side access door. This has a 75 litre National Luna fridge and a two-burner Dometic cooktop, with two plastic tubs dropping into an extendable frame at the outer end with a powered swivel tap above. Beneath the cooktop is a shallow cutlery drawer and a deep drawer with the crockery, glasses and cups in very space-consumptive foam rubber packaging. It’s an arrangement that has little room for meal preparation, which takes place at the pantry area behind the access door. The pantry – which has internal and external access – has a fold-down shelf at front, with a deep well behind and two shelves across the back wall, plus four large canvas storage pockets on the inside of the door. That door strikes me as a potential nuisance, projecting out at right angles from the camper body, or folding back and projecting beyond the rear wall line of the awning. A major assistance is the provision of a large 610 x 1850mm aluminium table which comfortably seats up to six people, and extends kitchen space and the general amenity of the whole camper. Conqueror’s UEV-490 has stepped up in the game with its Platinum edition. The UEV stands for Urban Escape Vehicle, and if you can't get right away from the pressures and annoyances of modern urban life with one of these then you really shouldn’t be camping. With a towball weight of 150kg, a Tare of a relatively light 1500kg and a load capacity of 450kg (1950kg GTM) this is a camper with a lot going for it. It does come with a few issues, though, such as the need to remake that front bed each time you set up, in a fiddly fashion working around the drawbar. The overall design is a bit 'clunky', if I can use that term, compared to more modern hybrid designs. However, this is a practical, go-anywhere camper. When we were at the Conqueror workshops there was a UEV-490 in for service following a twenty-something thousand kilometre trip around the nation and aside from being a bit dusty it looked fine. That’s why they carry the motto, 'Military Tough'. The move – even for the limited number Platinum models – to the new paint scheme alone lifts the image, and with a fresh and even higher spec version on the way we can expect to see Conqueror UEV-490s on our roads and outback tracks for a long time to come.